Natural Burmese Jade Gemstone Round Beads 6mm (~68pce Strand) - ~38cm Strand. 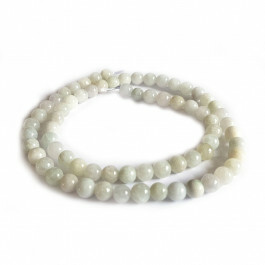 Natural Burmese Jade Gemstone Round Beads ~6mm (~68pce Strand) - ~38cm Strand. Burmese Jade is Jadeite which is the rarer and more valuable of the two. The most important source of gem quality jadeite is Upper Burma, near the small town of Hpakan. Today, virtually all top-quality jadeite is produced from these mines. Jade is considered a symbol of purity and serenity. A protective stone bringing harmony, good luck and friendship. NOTE: This item can not be shipped to USA due to U.S. import restrictions on Burmese Jade.